Yosemites great gray owl (Strix nebulosa) is the largest owl in the Sierra Nevada. 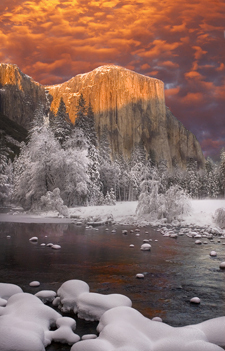 Despite its conspicuous size, it was rarely observed in Yosemite before the 1950’s. The owl is a common, but elusive, forest dweller of the northern part of this hemisphere. This big owl is described in Birds of Yosemite (a special issue of the Yosemite Nature Notes published in August 1954), as from 24-33 inches in size. The large light gray facial discs are marked faintly with dusky concentric rings and the eyes are yellow. There are no "ear" tufts as with the great horned owl. The colors are dark brown with light grayish mott­ling, and its under parts are light gray streaked lengthwise with dark brown. The Great Gray Owl’s full name is Scotiaptex nebulosa nebulosa. 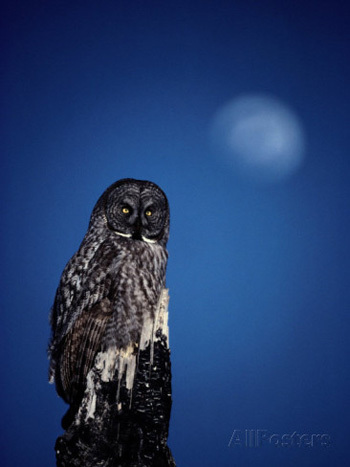 Scotiaptex is from the Greek words which mean "the Eagle-Owl of darkness". Nebulosa is Latin and means "cloudy" or "gray". Yosemites great gray owl has an impressive voice that produces a deep reverberating “whoo” that is repeated at irregular intervals. Yosemites Great Gray Owl Is A Big Bird! Much of the apparent size of this "Great Gray Ghost" is due to his fluffy fea­thers. When not fluffed up, he is significantly smaller in appearance than the great horned owl. Some have been found to actually weigh less than barred owls. But when this great gray owl is perched on a high overhead snag, it appears huge. Its head and face seem im­mense, and the rather small feet are often hidden beneath heavy feathering. Long wings and tail also increase its apparent size. Ornithologist write… "Its covering of thick down and long fluffy feathers (par­ticularly on breast) which make it seem so large and powerful, are grown as a protection from the cold." Most other owls will sit rather erect, but not the great gray who often sits with its body inclined sharply forward. This is especially true when he is watching something below him. 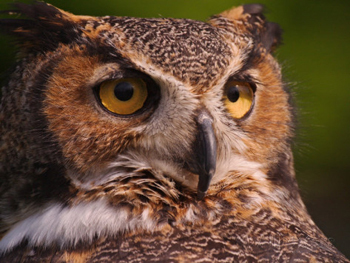 The lack of "feathered horns" and the his rounded head give him a more gentle appearance than the great horned owl, and several accounts have indicated that he is milder in manner. Dr. Dall claimed that while in the Yukon he had caught them by hand during the daytime. Ed Cordner was able to approach to within about twelve feet of one of the owls while hiking in Yosemite’s Peregoy Meadow.He was then able to obtain good photographs while it perched on a dead snag. 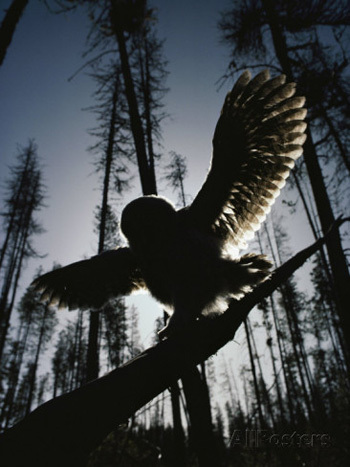 According to Robert McIntyre, movies were shot of owls at ranges down to thirty feet while in the vicinity of Crane Flat in Yosemite. The owl was never frightened and did not leave the area, but was very cur­ious. 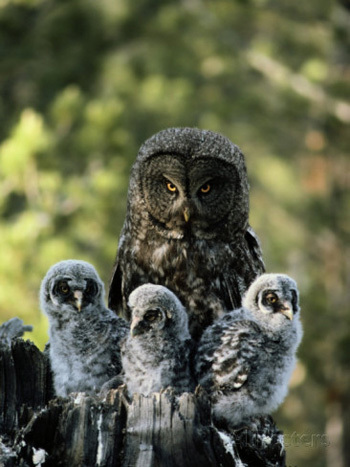 Way back in 1915 while Grinnell and Storer were making their classic survey of The Animal Life in the Yo­semite , the Great Gray Owl was first identified in the Yosemite Sierra. They observed that ". . . the bird was ap­parently quite at home, and nesting." They further stated ". 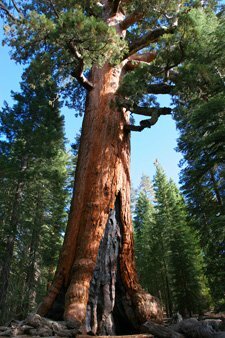 . . a large nest of sticks, one hundred feet above the ground on the close-set branches of a fir next to the trunk, was found, which, it is thought, belonged to the owls." It is well known that many birds will show similar adaptations for the performance of incubation during the nesting season. Yosemites great gray owl males lack these modifications, which would indicate that the female performs the duties of incubation. The time of egg-laying for these owls was apparently long past, and the brood of young that had been reared there had long since scattered. 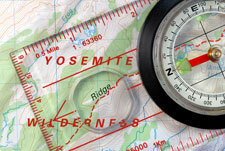 The most common areas where the great gray owls are seen in Yosemite are along the Crane Flat and Glacier Point roads. 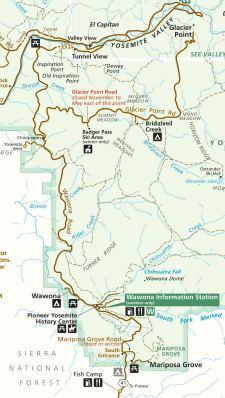 These are deep red-fir forests typical of the Canadian life zone, with elevations of 6000 to 7000 feet. Although both genders are alike in plumage, the female great gray is usually larger than the male. Two to five white eggs are normally produced which average about 2x13/4 in. in size. 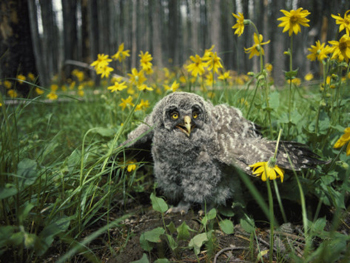 The owls nesting season in Yosemite begins in April or early May and only one brood is produced. The young immature birds begin molting around June and their adult plumage is usually in by October. The adults apparently have a com­plete annual molt ending in Novem­ber and December. Yosemites great gray owl is more active in daylight hours than is true of most owls. This may be due to the fact that in its typical “Far North” range the sun never passes below the horizon in the summer. Like most owls, food preferences consist of small mammals and birds. In the summer time, pocket gophers are a favorite source of food. 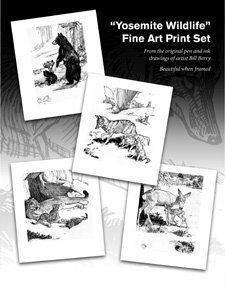 Bill Berry's Drawings Are Back! 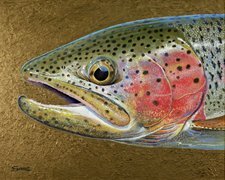 Did You Know There Are No Native Fish In Yosemite? 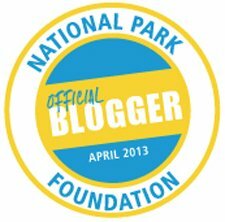 Most Of The Great Gray Owls Were Seen In This Area! 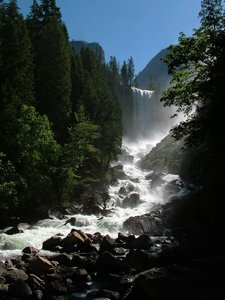 There Would Never Have Been A Yosemite Without Water!